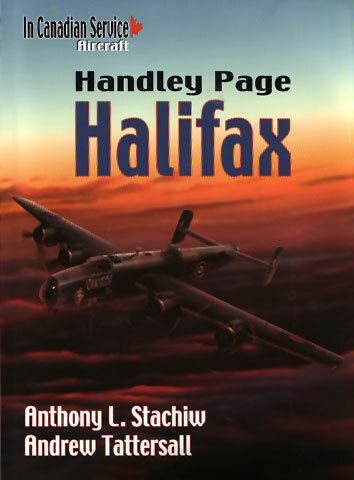 Vanwell Publishing continues its coverage of Canadian military aviation history with "Handley Page Halifax" by Anthony L Stachiw and Anthony Tattersall. The Handley Page Halifax is largely overshadowed by its more famous sibling, the Lancaster, but it had a critical role to play in the air war over Europe. In addition to its best known role as bomber, the Halifax performed anti-submarine, reconnaissance, transport and glider tug duties. More than 6,000 Halifaxs were manufactured, and these conducted more than 75,000 sorties. This book provides detailed information about this important bomber in Canadian service, in addition to being a very useful guide to variants, camouflage and markings of the Halifax in general. Chapter One describes the origins of the Halifax design, flight testing and production. Next, we are offered a summary of Canadian operations, followed by specifications and plans of all the major variants. This Chapter is also peppered with scrap views of important design features. Chapter Four covers Canadian Halifax units in some detail, including Squadron Orders of Battle at various stages of the war in Europe and a unit by unit description of operations and aircraft equipment by type and date of service. At 47 pages, this is the area of key focus. The book is wrapped up with a modelling summary after a discussion of camouflage, markings and a section with eight colour side profiles of various Halifax variants. The model summary includes a description of the few Halifax kits currently available (from Matchbox/Revell and Airfix in 1/72 scale; and Fonderie Miniature in 1/48) plus lists after market accessories and decals. Whether you are specifically interested in Canadian aviation, or you are a Bomber Command buff, Vanwell Publishing's "Handley Page Halifax" will be a valuable reference.